Northeast State recognized the 2016-17 Student Scholars at the annual Scholars Reception held Nov. 17 at MeadowView Convention and Conference Center in Kingsport. An album of photos of the event and the scholars can be viewed at www.northeaststatephotos.com. The Office of Scholarship Programs and Student Needs hosted the reception to honor students receiving scholarships both from and administered by Northeast State. More than 200 students received scholarships for the 2016-17 academic year. The complete list of scholarships and recipients can be found via this link 2016-17 Student Scholars. 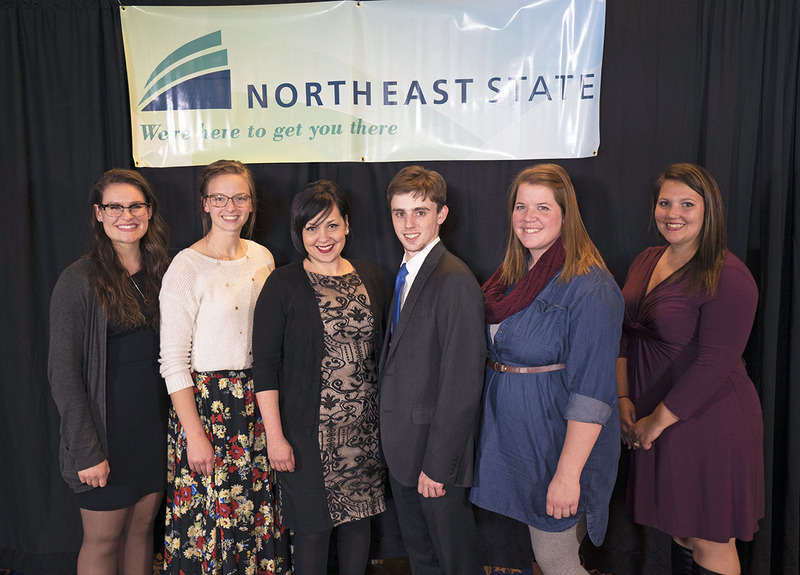 Northeast State proudly recognized our 2016-17 Student Scholars Thursday night. The deadline to submit a Northeast State Scholarship application is March 1, 2017. To learn more about scholarships available through Northeast State visit the website: http://www.northeaststate.edu/Financial-Aid/Scholarship-Programs-and-Student-Needs-Office/. Northeast State Community College welcomes musical legend and 2016 Grammy nominee Doyle Lawson with his band Quicksilver to campus for their annual “Homecoming” performance on Saturday, Dec. 3 at 7:00 p.m.
Lawson and Quicksilver will perform at the Wellmont Regional Center for the Performing Arts Theater on the College’s Blountville campus next to Tri-Cities Regional Airport. Advance tickets are $25 and can be purchased online now at www.northeaststate.edu or at the Box Office, 423.354.5169. Enjoy this intimate evening of bluegrass, gospel, and Christmas tunes with one of the best in the business. Doyle Lawson and Quicksilver return to the WRCPA Theater stage Dec. 3. Called a “mandolin virtuoso” with “perfectly silken harmony” by The New York Times, Lawson and Quicksilver have nearly 40 albums to their credit. Lawson and Quicksilver’s most recent album In Session was nominated for a Grammy Award as Best Bluegrass Album of the Year for 2016. 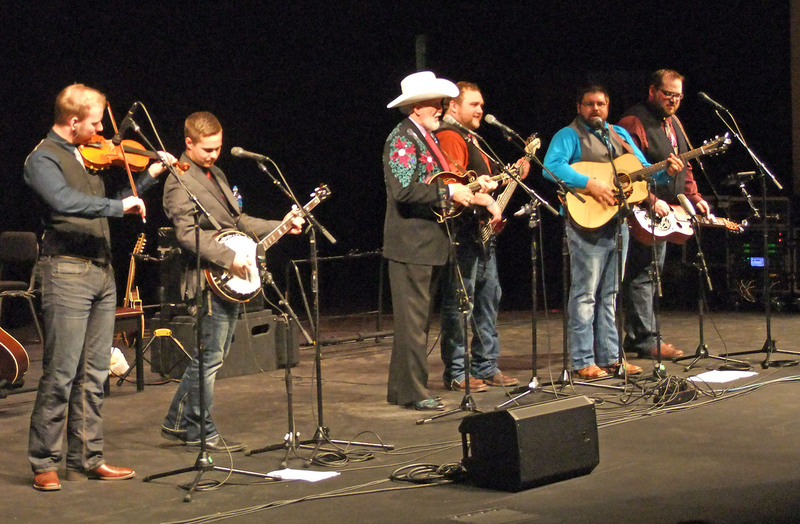 DLQ are seven-time International Bluegrass Music Association (IBMA) Vocal Group of the Year winners, and have multiple Grammy, Dove, Inspirational Country Music Association, and other IBMA award nominations. The band also earned Dove Award nominations for the Best Bluegrass Gospel Album and Best Bluegrass Gospel Song awards. Lawson is a member of the International Bluegrass Hall of Fame. He was inducted into the Hall of Fame in 2012 at the Ryman Auditorium. He has served as the feature instructor and performer at the College’s summer music workshops held at Northeast State at Bristol for two years. He shared his knowledge and expertise with students about recording tips and techniques as well as live performances and impromptu jam sessions. Doors open at 6:30 p.m. For more information call the Northeast State Box Office at 354.5169. Crazed fairies, bloodthirsty ogres, and monsters of all sorts populate the fantasy world of She Kills Monsters. The Northeast State Department of Theater presents this modern production running Nov. 10 to Nov. 20 by playwright Qui Nguyen. The new production continues the tradition of vividly creative and cutting edge productions from the College’s award-winning Theater Department. “I am exceedingly proud of my students, present and former, who have really had to step up to bring this visually exciting show to life,” said Brad McKenzie, director of Monsters and technical director of Northeast State Theater (NST). Monsters tells the story of Agnes Evans as she leaves her childhood home in Ohio following the death of her mother, father, and teenage sister, Tilly. Five years later when Agnes finds Tilly’s Dungeons & Dragons notebook, however, she stumbles into a journey of discovery and adventure in the imaginary world that was Tilly’s refuge. Madison Phillips plays Tilly in flashback scenes of the fantasy world. Phillips made her NST debut in One Flew Over the Cuckoo’s Nest last spring. She followed that with the lead role of Carole in Oleanna produced earlier this year. Her memories of Tilly propels Agnes into the adventure to learn more about the sister she thought she knew. Haley Forbes portrays Agnes, an imaginative young woman whose yearning for exciting life brings her more adventure than she ever expected. Agnes meets a wide assortment of characters and faces down many demons her sister fought through the game. Megan Proctor plays Lilith Morningstar, a feisty fairy queen wielding a battle axe. Despite Proctor’s fearsome character, she said Lilith hides a good heart. The play’s overarching theme of the beloved Dungeons and Dragons role-playing game highlights not only the game but the offbeat characters involved in the game. McKenzie had the cast and crew play a game of Dungeons and Dragons to get acquainted with the game and theme of the play. The play features a series of sword battles between the characters. Charles Clark serves as fight captain in charge of orchestrating the actors’ fight scenes and keeping cast members in one piece. He also portrays the evil lord of the underworld Orcus who is bent on destroying Agnes. 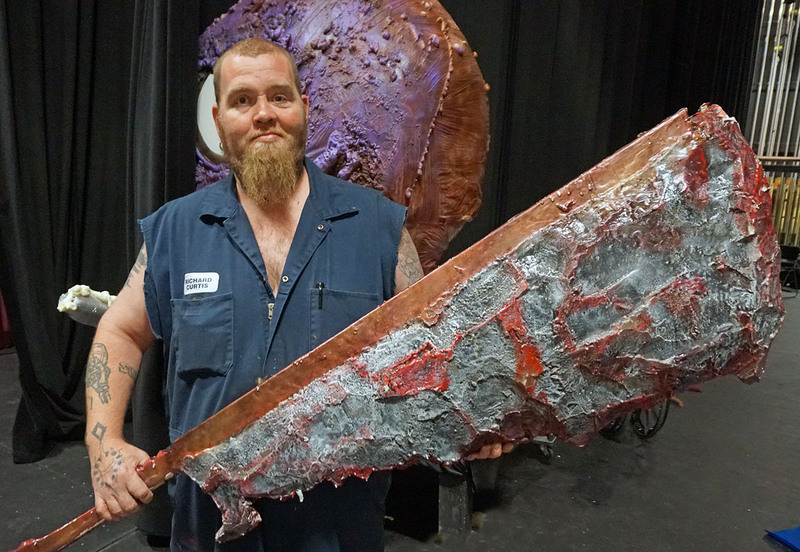 Building the weapons and armor fell to theater shop foreman and Northeast State alumnus Richard Curtis. An award-winning creative designer and theater veteran, Curtis returns to Northeast State after completing his bachelor’s degree in Theater at King University. The weapons wielded by the characters are formed with foam coated with resin to provide the hard structure needed for effect. Richard Curtis wields one of his newly created weapons. 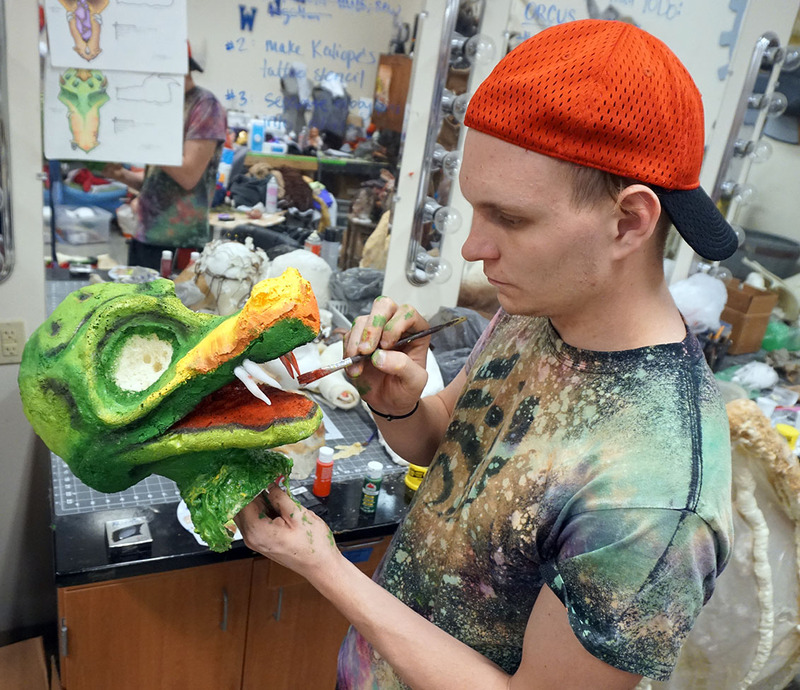 Designing the creature prosthetics, character masks, and large wearable wings fell to Northeast State alumnus and Theater veteran Dustin Lawson. Inspired by the game’s characters, Lawson sketched out monsters well known to D&D players and created masks to reflect them. Dustin Lawson creating one of many “monsters” for the play. 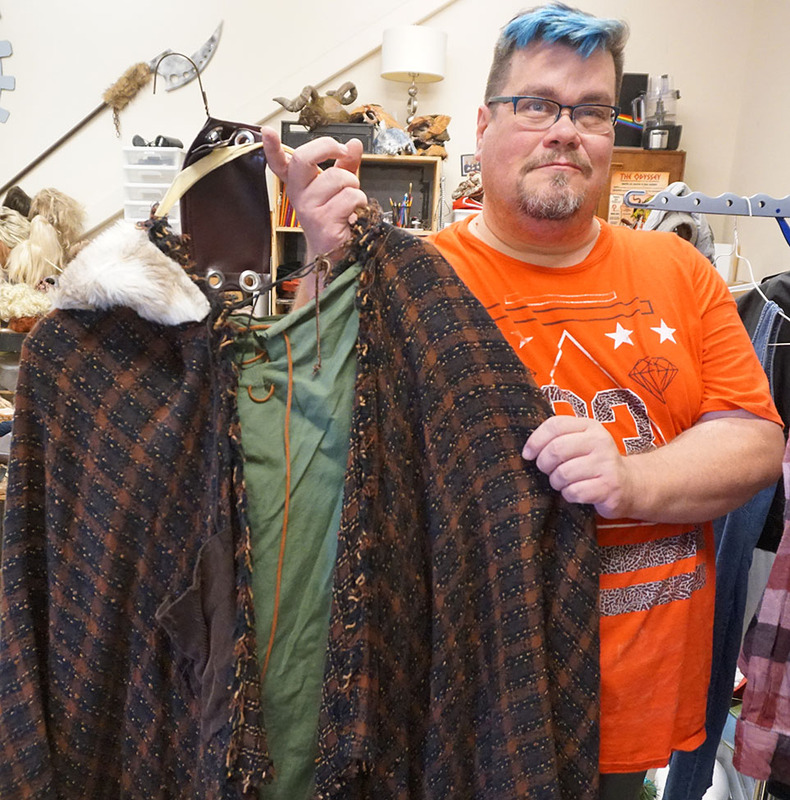 Marty France brought his skills to costuming a cast of regular and fantasy world characters. France’s work with costuming as well as hair and makeup has been showcased in numerous Northeast State Theater productions including Steel Magnolias and The Lion, the Witch, and The Wardrobe. Marty France with a character costume from Monsters. Agnes dealing with the loss of her family and expectations of a new life with her fiancé Miles (Aaron Musselwhite). The relationship between Agnes and Miles changes as she searches for answers and looks for strength on her quest. 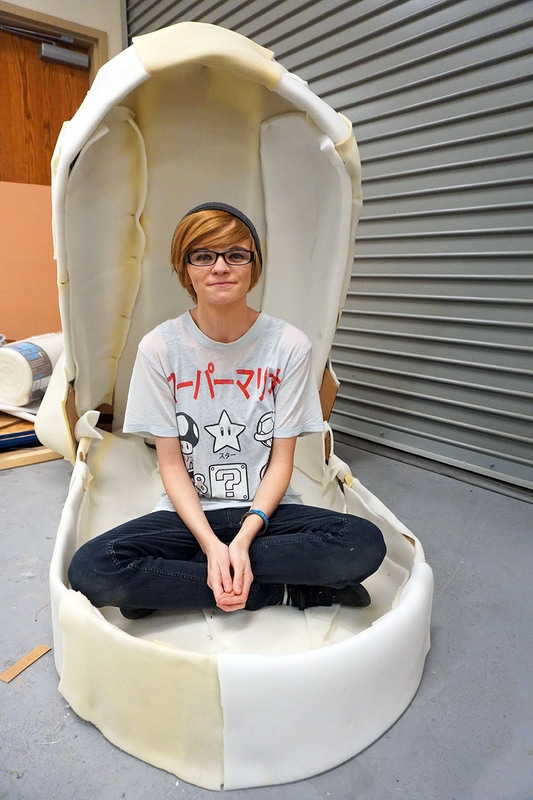 Puppet Designer Ashley Guy sits in the mouth of a dragon she is creating. While the play delves into adult and sensitive themes, cast and crew members agreed the show was not about prurient shock value. The play used fantasy and comedy to ask critical and universal questions about human beings and where we all fit in the world. The play involves mature themes and strong adult language and is recommended for audiences ages 18 and older. 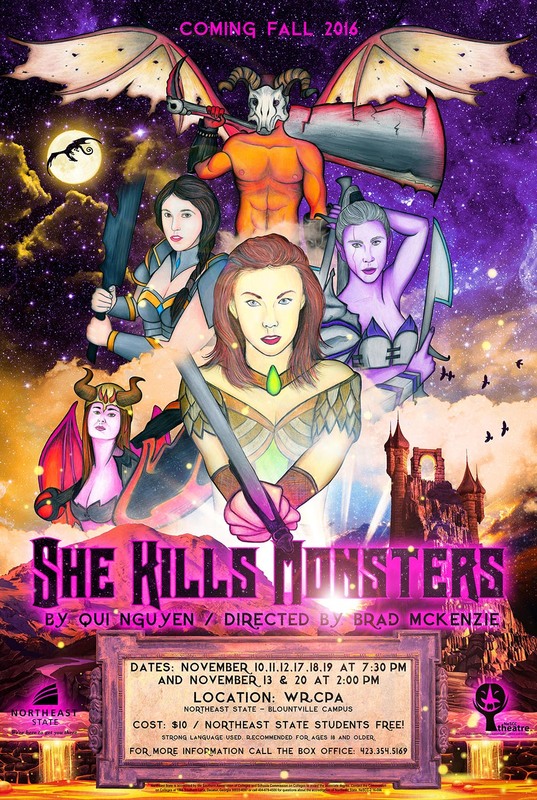 She Kills Monsters is produced by special arrangement with Samuel French, Inc. Tickets are $10 and admission is free to currently enrolled Northeast State students with valid identification. The play’s performance dates are Nov. 10, 11, 12, 17, 18, 19 at 7:30 p.m. and Nov. 13 and 20 at 2:00 p.m. in the WRCPA Theater. For tickets, visit www.northeaststate.edu/theatre or contact Northeast State Theater at 423.354.5169 or e-mail emsloan@NortheastState.edu. The Northeast State Department of Theater proudly presents the modern play She Kills Monsters opening Nov. 10 at 7:30 p.m., in the Wellmont Regional Center for the Performing Arts Theater at the College’s Blountville campus. The new production continues the tradition of vividly creative and cutting edge productions from the College’s award-winning Theater Department. Written by modern playwright Qui Nguyen, Monsters delivers a wonderful comedic romp into the world of fantasy role-playing games, She Kills Monsters tells the story of Agnes Evans as she leaves her childhood home in Ohio following the death of her teenage sister, Tilly. Five years later when Agnes finds Tilly’s Dungeons & Dragons notebook, however, she stumbles into a journey of discovery and action-packed adventure in the imaginary world that was Tilly’s refuge. In this high-octane dramatic comedy laden with homicidal fairies, nasty ogres, and 90s’ pop culture, Nguyen offers a heart-pounding homage to the geek and warrior within us all. Agnes journeys into a surreal world where all she thought she knew is turned on its head. The play asks critical and universal questions about human beings and our quest to know where we all fit in the world.